New SID for Mekameleen TV on 10730.00MHz, pol.H FEC:3/4 SR:30000: SID:10906 ( PID:961/962 Arabic - Clear). A new channel has started in DVB-S2 Clear: Mekameleen TV (undefined) on 10730.00MHz, pol.H SR:30000 FEC:3/4 SID:365 PID:1133[MPEG-4]/1645 Arabic. A new channel has started in DVB-S Clear: Mekameleen TV (undefined) on 12685.00MHz, pol.H SR:27500 FEC:5/6 SID:1450 PID:1451/1452. 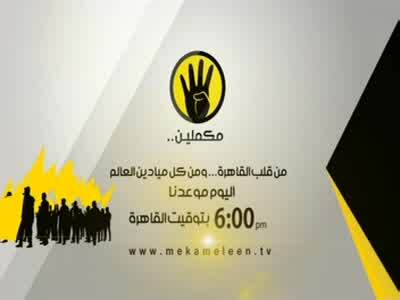 Mekameleen TV is back on 11012.00MHz, pol.H SR:27500 FEC:5/6 SID:8013 after a break ( PID:1813/2813 - Clear). New frequency for Mekameleen TV: 11096.00MHz, pol.H (DVB-S SR:27500 FEC:5/6 SID:27 PID:807/1063 Arabic- Clear). A new channel has started in DVB-S Clear: Mekameleen TV (undefined) on 11012.00MHz, pol.H SR:27500 FEC:5/6 SID:8013 PID:1813/2813 Arabic. A new channel has started in DVB-S Clear: Mekameleen TV (undefined) on 11142.00MHz, pol.V SR:27500 FEC:3/4 SID:365 PID:1133/1645 Arabic. New FEC for Mekameleen TV on 11678.50MHz, pol.H: FEC:5/6 ( SR:27500 SID:158 PID:381/382 Arabic - Clear). A new channel has started in DVB-S Clear: Mekameleen TV (undefined) on 11678.50MHz, pol.H SR:27500 FEC:3/4 SID:158 PID:381/382 Arabic. A new channel has started in DVB-S Clear: Mekameleen TV (undefined) on 12111.00MHz, pol.V SR:27500 FEC:3/4 SID:785 PID:151/152 Arabic.